Water-based formula optimizes disinfecting by ensuring surfaces stay wet longer. 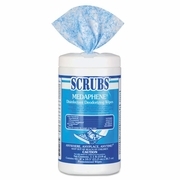 Dual-textured wipe breaks through bio-film, loosens and absorbs bacteria and contaminants. Effective against salmonella, staph, pseudomonas, TB, herpes simplex 1 & 2, influenza A2HK, rhinovirus, RSV, HIV-1 (AIDS virus) and others. Includes six canisters of 65 wipes each. 6/case, SOLD BY THE CASE.